It’s that time of the year again! Christmas Eve is upon us and we’ve decided to spread good tidings and cheers among friends in the form of a creamy and warm winter favorite. After testing out some our favorite old recipes, we’ve uncovered one that mixes up just the right amount of sugar and spice. Add your own spin on a classic eggnog favorite by serving in mason jars, adding ribbon and garnish with candy cane or spices! In a large bowl, combine egg yolks and sugar. Whisk together until fluffy. Whisk hot milk mixture slowly into the eggs. Pour mixture into saucepan. Cook over medium heat, stirring constantly for 3 minutes, or until thick. Do not allow mixture to boil. Strain to remove cloves, and let cool for about an hour. 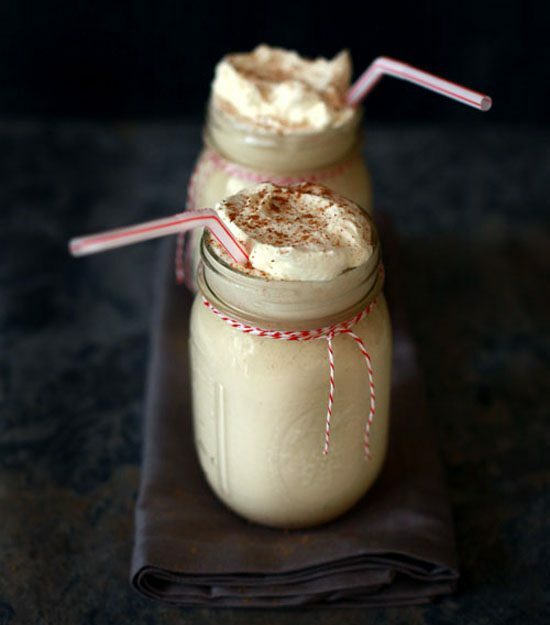 Stir in rum, cream, 2 teaspoon vanilla, and nutmeg. Refrigerate overnight before serving. This entry was posted in Cocktails and tagged eggnog recipe, holiday cocktails, holiday eggnog by admin.